mini rundown of the best stuff I've had recently. One of the best beers in the Midwest, and certainly the best fruit beer available. I imagined it would be akin to a Belgian kriek-like cherry bomb. Quite wrong I was. New Glarus uses one pound of Wisconsin cherries for each bottle (not your 12 oz. sixer bottle, mind you) and it's evident in the pungent aroma. I was slightly worried when I realized this wasn't going to be as tart as the sour beers, because I typically loathe cherry-flavored things. In fact, the Sam Adams Cherry Wheat was one of my least favorite beers I tried in 2008. But this cherry was different. It had immense sweetness, but not like a Popsicle or sucker. It was sweet like the gooey inside-the-pie cherries, a real richness that couldn't be faked by synthetic flavoring. There was enough tartness to keep the sweetness at bay, though, and the late sparkle scraped my mouth so that I was ready for another sip. Kristie and I enjoyed this one together, and it's exciting to me that I now have a better grip on the types of beers she might enjoy. I wish they didn't cost $10 a bottle, but it's exponentially better to enjoy a beer with company. This beer (and the myriad of other New Glarus crafts) are well worth the 45-minute drive to Wisconsin, and I plan on making semi-regular trips from here on out. 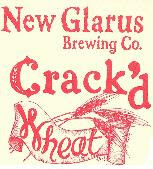 Prior to my whimsical February jaunt to Hudson, I'd had only one New Glarus beer--the infamous Spotted Cow. Thought it was below average and not worthy of the hype I'd heard from my Madison brethren. I had no idea they had as expansive a line of reign-free beers as they do. This one sounded interesting, and both employees said they'd had it and were pleasantly surprised. It's an interesting idea. It is, basically, a wheat beer. But it's also dry-hopped with amarillo hops. To dry-hop a beer means to introduce hops after the fermentation has begun. It's a way to give the beer an extra hop kick and bring out the characteristics of the specific hops used. It's a pretty common tactic, but this is the first I'd heard about a wheat beer being dry-hopped. Though gimmicky, the idea sounded quite interesting to me, especially because wheat beers generally all get lumped into the same clovey/spicy/orange-peely heap for me. It tastes exactly how you would imagine. The smell is all spicy wheat, and wheat is obviously the base of the beer. But the amarillo hops kick in toward the middle of each gulp and leave the beer's lasting impression. The beer is bottle-conditioned, another common brewing practice meaning the beer finishes the fermentation process in the bottle. Always a plus, and it usually guarantees a large frothy head, which I happen to enjoy. Potentially the perfect summer beer, though later tonight I plan to enjoy their Berliner Weiss, which I've heard is phenomenal. Light as a wheat with the bold hops of a pale ale. I foresee many more of these come July. It's all basically been said about IPAs. We love the citrus, love the dryness, love the hops, love the mouthfeel. This is no different, and it's an excellent representation of the style. I know I've had it in the past, before my tastes were honed, so I wasn't surprised to like it again. Had to go to Wisconsin to get it, which makes no sense to me. Stone IPA is a very good beer. And I agree it stinks we don't get their stuff here in the Twin Cities. I've made the trip to Hudson multiple times to load up on Stone, Dogfish Head and others.